digitalECMT recently set a challenge at the Genomics, Biodata and Improving Health Outcomes Hackathon. 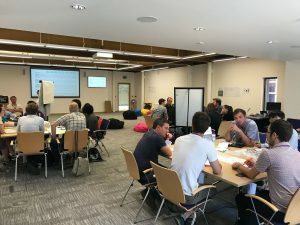 The event took place at the Wellcome Genome Campus in Cambridge on 2nd-3rd July 2018. 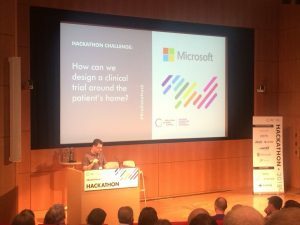 Paul O’Regan – Clinical Informatician and Laura Hutchinson – Business Analyst, set the challenge “How can we design a clinical trial around the patient’s home?” – sponsored by Microsoft. In addition, Paul and Laura supported the four teams participating in this challenge. The winning team devised a product called ‘D-BOX’ (Doc in a box) which incorporated a refrigerated box for sample collection, a timed pill box and a patient dashboard. Judges included Simon Weise-O’Connor from Microsoft and Joanne Hackett, the Chief Commercial Officer of Genomics England. The prize included mentoring with Iain Buchan of Microsoft and Dónal Landers and Jason Swift from digitalECMT.